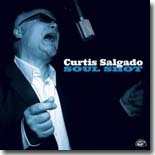 Curtis Salgado's new CD on Alligator, Soul Shot, is already the front runner for best album of the year, thus it's no surprise that this soulful disk checks in as this month's Pick Hit. Our Surprise feature this month is the documentary DVD produced by Roger Stolle and Jeff Konkel, We Juke Up in Here! : Mississippi's Juke Joint Culture at the Crossroads. The family of late harmonica master Gary Primich has re-issued some of his past recordings in a wonderful double-CD entitled Just A Little Bit More .... This loving tribute was an easy choice as our Flashback feature for the month. Our What's New section features new releases from The Nighthawks, Walter Trout, Bill "Sauce Boss" Wharton, Dave Perkins, Peter Karp & Sue Foley, Kilborn Alley, Tricia Freeman, JT Coldfire, and more.